Hockey equipment in the 1930’s and ’40s compared to what is available today is akin to the difference between an abacus and an iPad. Still, the rudimentary offerings of gear were considered luxury items in many households. A decent pair of skates, especially, was a rare find. Eveleth’s John Matchefts had one option if he wanted to play hockey with the rest of the neighborhood kids. “They were high blades, but hell, that’s all we had, so I used hers,” Matchefts said about his sister’s figure skates. “Of course, they were too long for me. By the time Matchefts was 16, he was fully grown at a stocky 5-foot-6 and renowned as something of a skating and stickhandling wunderkind. 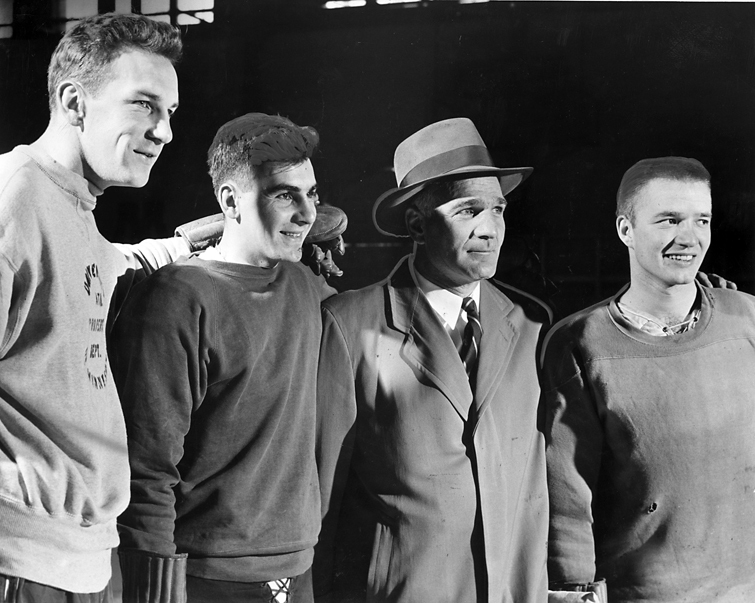 Matchefts was held in such high regard he was invited to Boston to try out for the 1948 U.S. Olympic team. 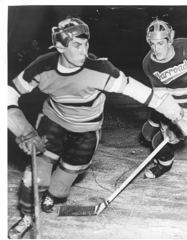 As a sophomore playing in the 1947 state tournament, Matchefts had three goals and three assists in three games as Eveleth finished in fourth place. He tied with four other players for the tournament scoring title and was the lone Eveleth player named to the eight-member all-tournament team. 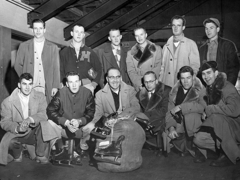 Matchefts scored a stunning nine goals and added five assists to not only lead the 1948 tournament in scoring but also power Eveleth to an unbeaten season and its second state championship in the four-year history of the event. Matchefts’ had good end-to-end speed, but it was his quickness that made him all but untouchable. His hands moved as fast as his feet, leaving defensemen little chance of seeing the puck, much less stealing it from the Golden Bears’ pocket tornado. “He was a role model for me,” said John Mayasich, another standout Eveleth forward who was two years behind Matchefts in school. “He was very quick, and he was smart. He could deke, he could hit; he had everything. 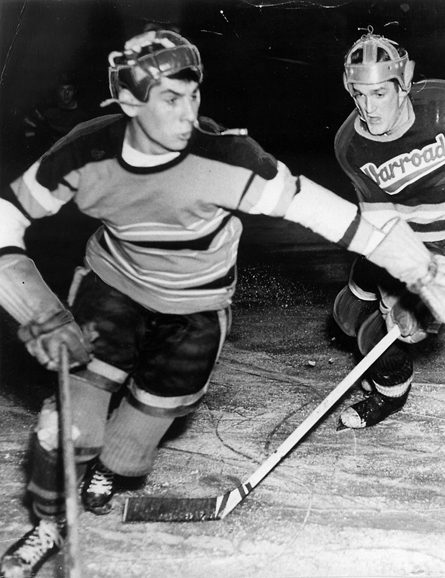 Eveleth beat White Bear Lake 6-0 and Warroad 8-0 to reach the championship game of the 1949 state tournament. Matchefts had a goal and an assist in Eveleth’s 4-1 triumph over Williams that capped another undefeated season. Matchefts became the first of 13 players to be named to the all-tournament team three straight years, and he finished with 26 points (14 goals, 12 assists) in nine tournament games. He ranks fifth in all-time state tournament career scoring. Joe Matchefts, John’s father, was a 6-foot-3 baseball star who grew up in Virginia. Joe was a pitcher on a local barnstorming semi-pro team that would play games as far away as in California. “I didn’t get those genes,” Matchefts said about his dad’s height, adding that his mother, Lena, was about 5-1. Matchefts said he tried pitching for the Golden Bears but quickly discovered he was better suited for shortstop. “He reminded me of (Phil) Rizzuto, the shortstop for the Yanks,” Mayasich said about Matchefts, who also was a standout sprinter on the track team. 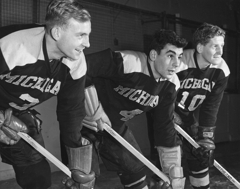 Hockey was Matchefts’ sport of choice, and coming out of high school he declined offers to play professionally in the minor leagues. Instead, he continued his career in college for Michigan. 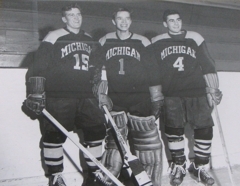 Matchefts was an All-American selection on Wolverines’ teams that won national titles in 1951 and ’53. 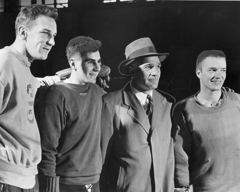 He was academically ineligible for the second half of the 1952 season, or he would have been a regular on a third championship team. 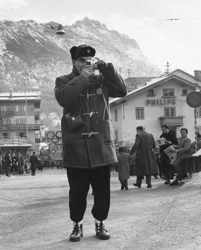 Matchefts, who had traveled to Boston as a 16-year-old for that Olympic team tryout, didn’t travel to St. Moritz, Switzerland, for the 1948 Games. He was, however, on the 1956 U.S. squad that won a silver medal in Cortina d’Ampezzo, Italy. Matchefts coached high school hockey in Thief River Falls and Eveleth, then took over the head coaching position at Colorado College in 1966. 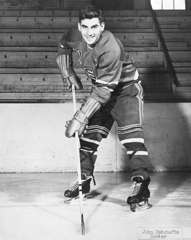 He left Colorado College for the Air Force Academy, where he became head coach in 1974. He guided the Falcons for 11 seasons before retiring. Matchefts lives in Colorado Springs with his wife, Carolyn.